These aren't your momma's Brussels sprouts, friends! More than likely, the Brussels sprouts you were forced to eat served as a child were from the frozen section of the supermarket and were boiled to oblivion resulting in a mushy, sulfur-smelling disaster! No wonder we never liked them! First of all, using fresh Brussels sprouts makes a major world of difference. Secondly, roasting the sprouts takes these babies to a whole new level. Add a little garlic aioli on the side for dipping and you've got yourself a mighty yummy side dish! P.S. 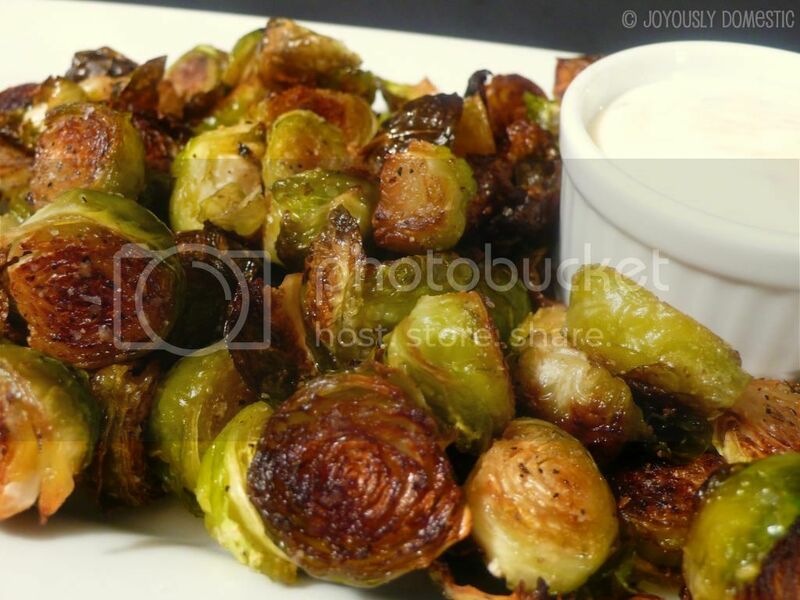 I didn't realize until today that there is a "s" at the end of Brussels when referring to "Brussels sprouts" and that it should always be capitalized. One really does learn something new everyday! Place Brussels sprouts on a baking sheet and drizzle with olive oil. Sprinkle on salt and pepper to taste. Mix around Brussels sprouts on pan to ensure that they all get nicely coated in the oil. Mix together mayonnaise, garlic, parsley and lemon juice. Serve in a ramekin alongside the roasted Brussels sprouts.